Now that it is July, it is officially summer! This is the best time of year for fresh produce and right now tomatoes are really coming into season. I picked a ton of them from the garden this this weekend and now I am looking for some fun ways to use them up. During the winter, I buy tomatoes and I think they taste OK, but when you bite into a fresh tomato from the garden, nothing compares the taste. It’s crazy how different and flavorful it is compared to winter tomatoes. 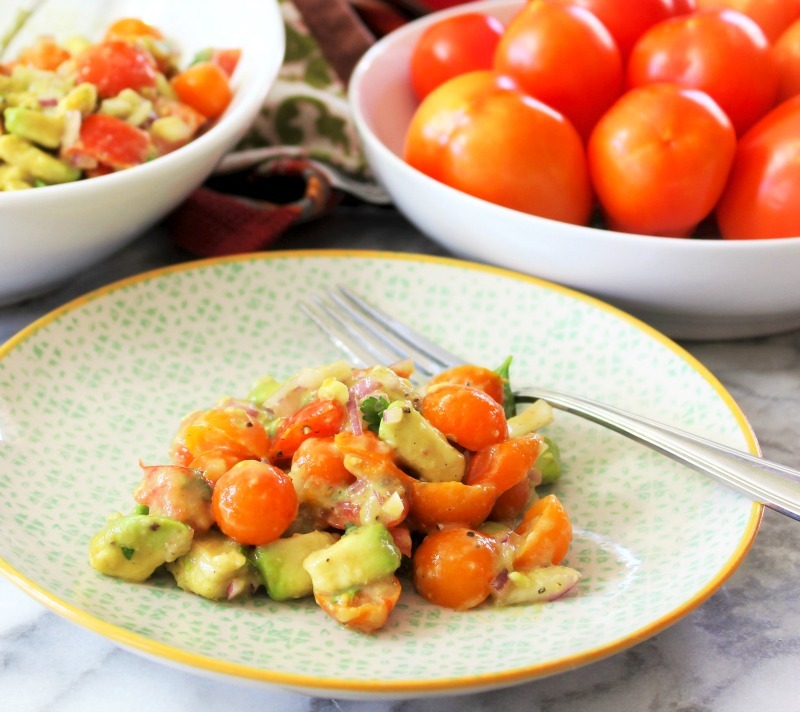 Anyway, enough blabbing, I have for you a simple Tomato & Avocado Salad. This salad is so good. It’s light, creamy and has amazing flavor without adding any dressing. 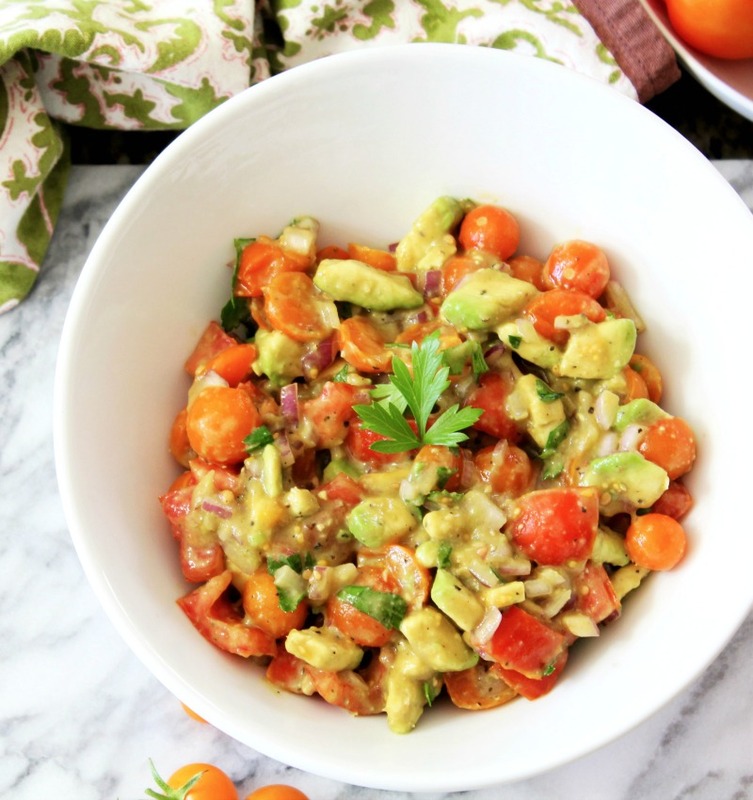 It’s made with cherry tomatoes, plum tomatoes, onion and avocado. Pretty simple. 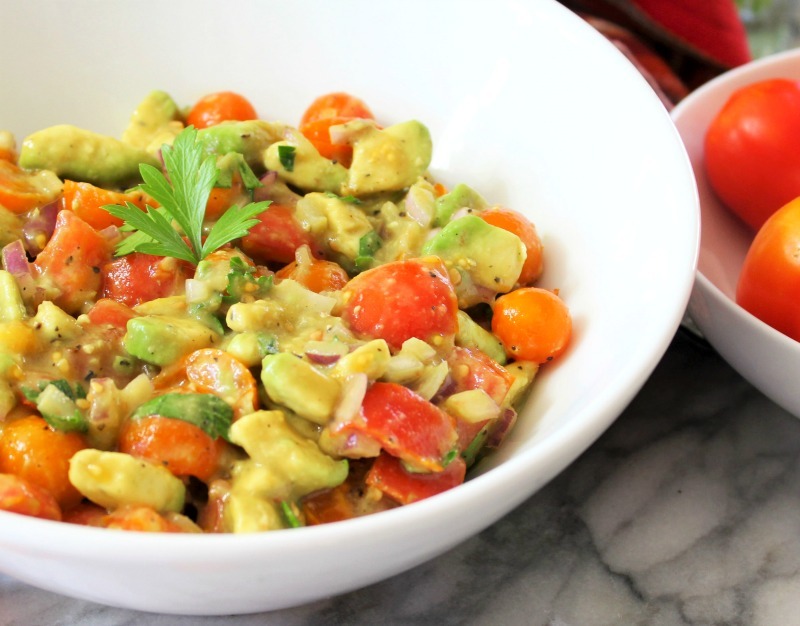 The avocado makes the salad so creamy that you don’t need any dressing. Avocado is one of those fruits that I buy weekly and never use it. By the time I do, it’s over ripe. I waste so many avocados, so today was the day to use my weekly buy. The avocado was soft, but perfectly ripe. 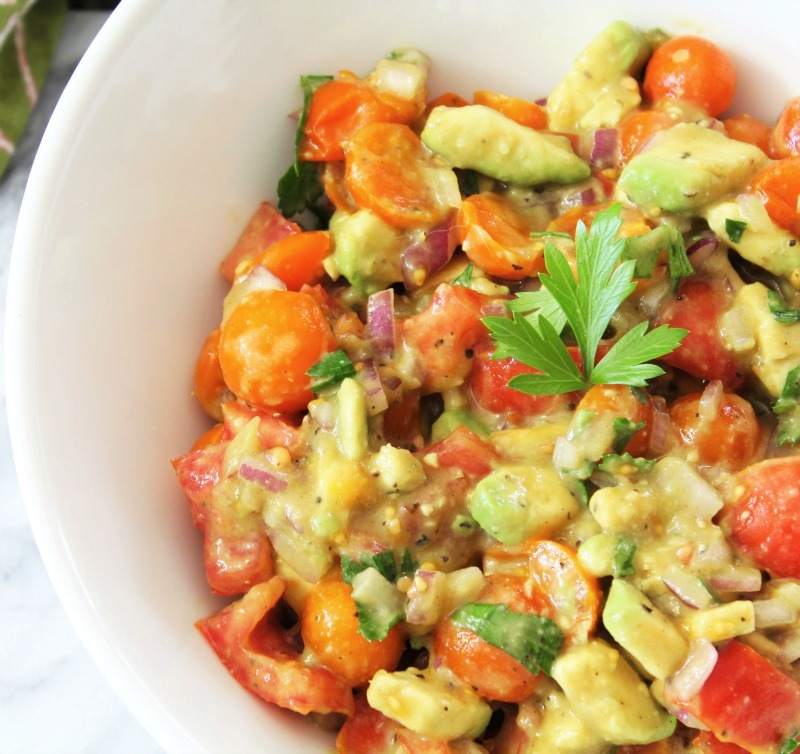 I can’t get over how it made this salad so creamy, it’s just craziness to me. For the rest of the salad, I used little orange cherry tomatoes and a few plum tomatoes. I had a bit of red onion left from a recipe, so I thought I would throw that in. The tomatoes are naturally sweet and the onions added a pinch of savory flavor. For seasoning all I added was some fresh parsley and salt & pepper. That’s all you need. Oh and the lime juice was just to keep the avocado from turning brown. You really do not taste it to much. I just love simple salads like this and it keeps for a day or two in the refrigerator. Just be sure to seal it well. 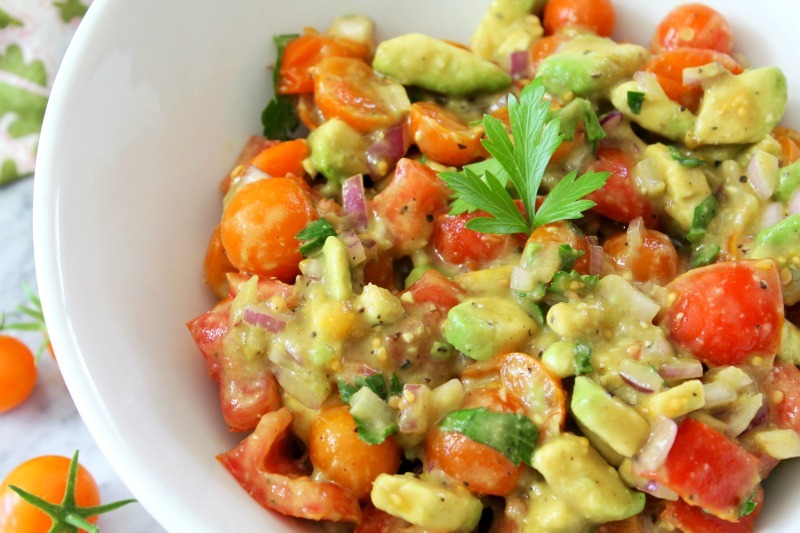 You can also make it ahead of time, just add the avocado prior to serving. 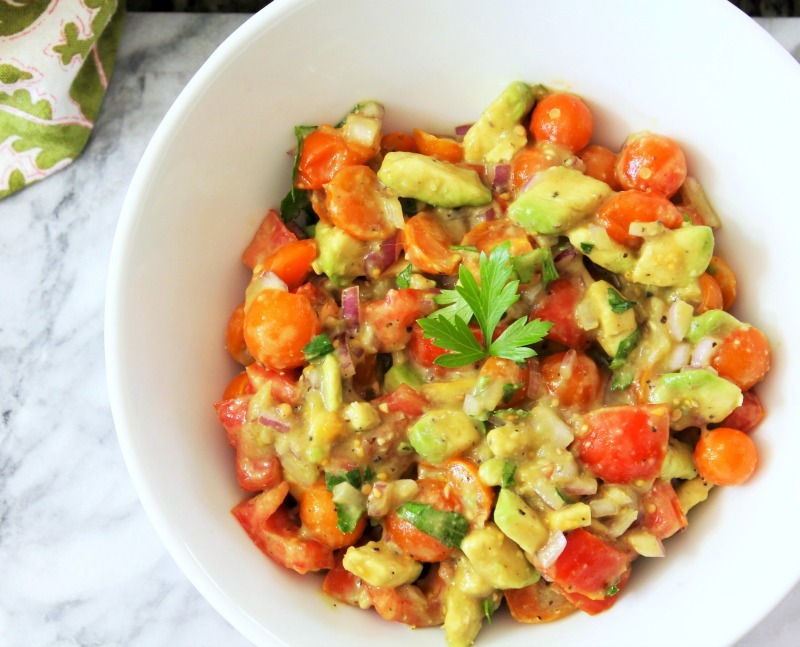 A light, creamy flavorful salad with tomatoes, avocado and onion. In a bowl, add tomato, onion, salt & pepper. Mix until combined. Let it sit for about 5 minutes to get juicy from the salt. Add avocado, and lime juice, mix until combined. Mix in fresh parsley. Add more salt & pepper to taste. Use a mixture of whatever kind of tomatoes you like. I hope you enjoy your day! I have the day off, so it will be more cooking and baking. I just love being at home.